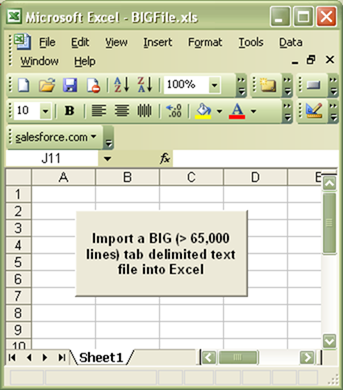 For those of us who have not yet upgraded to Excel 2007, we are still stuck with the 65,536 row limit on a spreadsheet. The BIG File Utility opens a text file, places the first 65,000 rows in Sheet1 of a new workbook, puts the next 65,000 rows in Sheet2 and so forth until the file has been completely opened. Download the BIG File Utility here.